The PawSox struck early in the contest, as Mark Hamilton's (pictured) two-out double in the first inning scored catcher Ryan Lavarnway from first base. The PawSox would add a second run, which would prove the difference, in the fourth inning when Bryce Brentz doubled home Hamilton, who drew a one-out walk. While Pawtucket was able to muster together three runs, they did so on just four well-timed hits, two of which came off the bat of Lavarnway. In the first half of Friday's doubleheader, which was held to make up Thursday's rainout, Portland prevailed over the New Britain Rock Cats (MIN), 6-4. Leading the charge for the Eastern League leading SeaDogs was first baseman Travis Shaw, whose third inning three-run home run opened the scoring for Portland. Matt Spring would follow up Shaw's home run with a two-run shot in the fourth inning. On the mound in the first game, Charlie Haegar, who picked up his first win of the season, battled through 5 2/3 innings of work, surrendering four runs on five hits and five walks. In relief, tall right-hander Chris Martin extended his scoreless streak to start the season to 21 innings. The SeaDogs did not fare so well in the second half of their doubleheader, as they fell 6-0 to the Rock Cats. 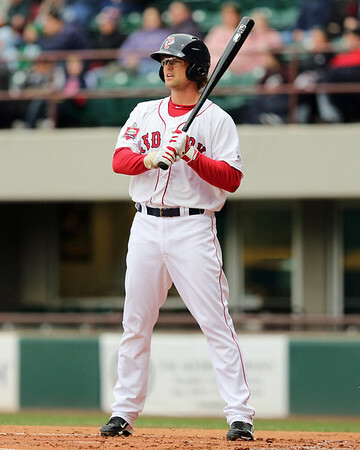 Peter Hissey and Xander Bogaerts managed the only two hits for Portland in the game. Receiving little support, starter Brandon Workman, who is off to a strong start, struggled on the mound, giving up five earned runs on eight hits in 5 1/3 innings. Workman did strike out six, giving him 48 strikeouts on the season, which ties him for second place in the Eastern League. The Salem Red Sox scraped across one run in Friday's 5-1 loss to the Myrtle Beach Pelicans (TEX). All five hits in the game were scattered among five players, with the team's lone RBI coming on an eighth-inning bases loaded walk to the Carolina League's leading hitter, Garin Cecchini. On the mound, starter William Cuevas kept his team in the contest for five innings, surrendering only three runs (one earned) in his five innings pitched. The Pelicans offense, which opened the scoring with a three-run fifth inning, was aided by a Cuevas wild pitch and a throwing error. The Greenville Drive powered their way past the Augusta GreenJackets (SF), 10-6, on Friday. The 11-hit offensive explosion was powered by leadoff man Mookie Betts, who collected three extra-base hits, including a fifth-inning solo home run, on his way to a four-hit game. While Betts led the charge, two other Greenville players collected home runs, including designated hitter David Chester, who picked up his sixth long ball of the season on a two-run shot in the seventh inning. Drive pitcher Brian Johnson continued his success, giving up only three hits in his five innings of work. Johnson lowered his ERA to 2.18, while picking up his first win of the season. Player of the Day: Greenville leadoff man Mookie Betts stuffed the box score on Friday in the Drive's 10-6 victory over Augusta by collecting four hits, three runs scored, and two RBI in his five plate appearances. Betts, 20, is batting just .229 on the season, but has produced a line of .344/.523/.625 in his last 10 games. While Betts' average is low, he has made up for it with his patience, posting a .409 OBP on the season. Photo Credit: Mark Hamilton by Kelly O'Connor.